If you have a child just starting to read chapter books, you are no doubt familiar with the Magic Tree House series featuring a pair of time traveling siblings. But what do you read when you finish the 4,683 books in the series? 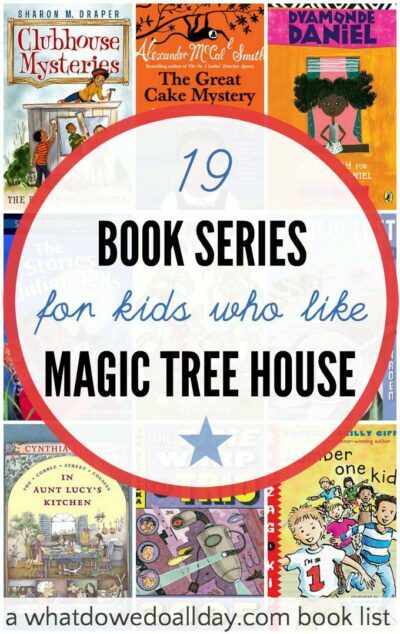 Where will you find more books like Magic Tree House so your kids can keep reading, reading, reading? 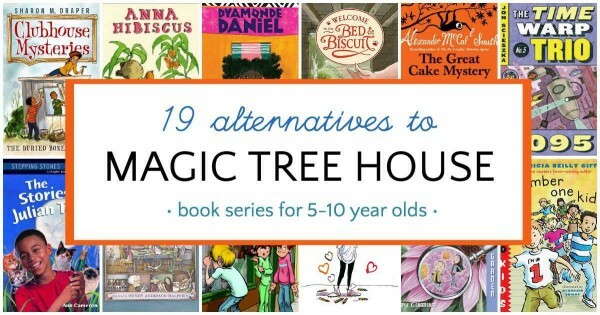 For this list, I’ve chosen a combination of books that have plot elements similar to Magic Tree House, like time travel, adventures around the world, siblings or friends solving mysteries, but other titles I feel are simply good counterpoints to the famous series and will expose kids to other types of stories they will enjoy. Now I admit, not every book series on this list is a masterful work of literature. While, I have selected books that feature excellent writing, I’ve also included some that, while they not might be quite as good, are still age appropriate and popular with kids. Time Warp Trio. With the help of a special and mysterious book, three Brooklyn boys travel through time and space to places like Camelot, Ancient Rome and Revolutionary America. They meet neanderthals, vikings, gladiators and their great-great grandchildren. With Sciezka’s quirky humor, this makes for entertaining reading. Greetings from Somewhere. Simon & Schuster has a bunch of “Little Simon” early chapter book series that are appropriate from ages 5-9. This series focuses on a globe trotting pair of twins. In each book the siblings solve a mystery in a new locale. Piper Green and the Fairy Tree is a new, very easy to read series. Piper lives on a small Maine fishing island. One day when she is avoiding school she hides in a tree which turns out to have a magical secret. A Precious Ramotswe Mysteries. Precious Ramotswe of the No. 1 Ladies’ Detective Agency book series for grown-ups solved her very first case in Botswana when she was just a girl. When her friends’ lunchtime treats go missing Precious is on the job and when she discovers the surprising thief a nice chuckle is had by all. This book is nice way of exposing young readers to other cultures and includes a reading guide, glossary, activity ideas and even a recipe! So far, there are three books in the series — all quite enjoyable, especially for read alouds. Clubhouse Mysteries. A diverse group of four boys call themselves the “Black Dinosaurs”, build a clubhouse, decode secret messages and solve mysteries. This is a solid series from Sharon Draper (a well respected author who has written award winning middle grade and YA fiction) that kids will like. There’s a bit of humor, appealing characters and, of course, some mystery. Andrew Lost. Andrew and his cousin Judy are accidentally shrunk when a science experiment goes haywire. In each book their minature size allows them to experience close up a different science theme – from the senses, to the environment, to the ocean, and so forth. There are a lot of facts in these books. A LOT. Truthfully, I didn’t enjoy this series as a read aloud and there was one character that I found particularly annoying. However, I do recommend this series for kids who love non-fiction . Anna Hibiscus. This is an absolutely wonderful series about a girl living with her extended family in Africa. It’s gotten loads of praise by all the critics, and deservedly so. It’s a lovely way to introduce your children to family life in another culture. If, like me, you are disappointed with the adventures Jack and Annie have in Africa, turn to this series. The Secrets of Droon is a fantasy series which uses a similar conceit to Magic Tree House, in which the characters have to piece together clues across a number of books. This series isn’t going to win any awards, but it will keep kids reading, and if they enjoy it, all the better. Find it at the library. Cobble Street Cousins is a well written series. Three cousins live with their aunt while their professional dancer-parents are touring the world. Lily, Tess and Rosie have lots of wholesome neighborhood adventures like baking and selling cookies and putting on theatricals. For parents who want to avoid sassy characters, this is a good series; lauded author Cynthia Rylant has a talent for writing stories which are simultaneously modern and old-fashioned. Zigzag Kids. Ranging from kindergarten to 6th grade, the multicultural Zigzag Kids come together for an after school program where they engage in fun learning experiences. Each book focuses on a different kid. Moms who loved reading The Cat Ate My Gymsuit (That’s me. I’m older than you.) will be tickled to give their kids the Amber Brown series. Amber is truly irresistible, faces a variety of situations like dealing with missed friends and divorced parents. Author Danziger is a real pro who makes reading about life as a kid entertaining and realistic. Cam Jansen is a perennial favorite and for good reason. I know I wish I had a photographic memory to help me solve mysteries! I learned via the official Cam Jansen website that the first book was inspired by a real like incident while the author was taking care of his infant son! Dyamonde Daniel. In this series, written by Nikki Grimes, a Coretta Scott King-award winning author, self-confident Dyamonde Daniel moves to a new apartment with her now-single mother. Dyamonde is a appealing heroine who continually demonstrates and acts upon her compassion for others. The Chicken Squad is an spin off of J.J. Tully Mystery series (found on our list of mystery early chapter books). We read the second book first, and it was one of my son’s best books of the year in 2014. We’ve since read the first book in the series about Dirt, Sugar, Poppy, and Sweetie, chicks with varying degrees of intelligence who solve backyard crimes that inevitably involve the squirrel population. The Kingdom of Wrenly. This series is good for kids who like fantasy. I probably would have loved it as a kid, even though I found it a bit unsophisticated. However, the series has loads of fans, and I’m for anything that gets kids reading. Lucas is a reluctant prince. He’d rather dress in peasant clothes and hang out with the village children. He makes friends with Clara, the daughter of a seamstress and the two team up to find the queen’s missing emerald. Lots of traditional fantasy elements like fairies, wizards, mermaids will appeal to kids who like imaginative worlds. Space Taxi. My older son has enjoyed many of Wendy Mass’s middle grade books and this new series is a collaboration with her husband. 8 year old Archie’s dad is an intergalactic space taxi driver! Archie is finally in on the family secret (which still has to be kept hush-hush from his younger sister) and gets to tag along on a “take your child to work day.” Along the way they pick up, and team up with Pockets, a talking extraterrestrial cat who also happens to be an Intergalactic Security Force officer. This is a wonderfully imaginative series and I know we will be picking up further installments as they are written. The Stories Julian Tells. When I first brought this book home from the library, Kiddo informed me that his 2nd grade teacher told the class these were some of her favorite books. I haven’t read them all (yet) but I can see why. I was tempted to judge the book by its cover (I am not a fan of photo-covers) but am glad I gave these well-written books a chance. Imaginative Julian gets into mischief with his tall tales, but fortunately he has a loving, forgiving family. There are also books about Julian’s neighbor, Gloria and his younger brother, Huey. A to Z Mysteries. The A to Z mysteries is a super-popular series about a team of kids solving mysteries, one for each letter of the alphabet. The three main kid-sleuths are well drawn and the stories entertaining and suspenseful. When you’re done with letter Z, you can turn to A to Z Mysteries Super Editions for more fun. Bed and Biscuit. Grandpa Bender is a vet with a house full of loveable, delightful and well-meaning animals. If you are reading aloud to your child, you will enjoy this series, too. Are you as obsessed with finding good children’s books, like I am? Subscribe to our newsletter and never miss another Monday book list. We are on the last book ( I think) of the Magic Treehouse series. My son was almost in tears the other day when he heard that there wasn’t another book yet. Can’t wait to check out some of these other series with him and my daughter. I’m so glad this list will be useful for you. How would you rank them for literature quality? My first grader read the entire Magic Treehouse series and is finishing up Imagination Station. I’d like to get him on the road to quality literature now that his reading skills are improved. Wrenly, Droon, Greetings from Somewhere, and Andrew Lost are (in my opinion) the least well-written of the bunch. All of the other ones are fairly good. We just discovered Piper Green, and she’s a huge hit with my daughter. Hoping for more of them! Wonderful! I think there will be more. At least I hope! Holy cow, I love this list. My library holds list just got very long. Thank you! My seven year old granddaughter (second grade) likes scary books. Suggestions? I don’t want to make them too scary and they are hRd to choose. Hi Catherine, Would you like to read her a picture book. The Tailypo by Paul Galodone is good, as is The Little Old Lady Who Wasn’t Afraid of Anything. I’m not as familiar with scary chapter books. You could try The Graveyard Book by Neil Gaiman, or one of the books on this list: http://www.scholastic.com/parents/resources/book-list/funny-scary/spooky-scary-chapter-books Goosebumps is a popular chapter book series for this age. I hope this helps! Happened upon this by chance. My boys are 14 and 17 now. I read to them until they were approx 11 and 14. We had a bookclub for the elder for 4 years, and my youngest’s bookclub is in its sixth year. Some much-loved series as they got older: Rick Riordan’s Percy Jackson Olympians series, John Flanagan’s Ranger’s Apprentice, Chris Bradford’s Samurai series. Thanks for this inspiring list. Although reading to and with my 5yo is something I totally enjoy, reading the first 20 books of The Magic Tree House in order for the 4th time in less than 5 months (plus the same books in aleatory order over and over again) is just… too much. We love Anna Hibiscus too! The others.. we have to see where we can find them. We live in Spain, so English resources are limited. We recommend Little Legends series. It’s fun and well written with smart plots. Plus the originality that comes from mixing characters from different fairy tales (Little Red Riding Hood, Jack, Hansel, Gretel, Rapunzel and others). The fact that one of the characters in the first book is Jack (like we know what other character) helped too :)).